Veneto's regional government is committed to ensuring that the region plays a leading role on the European and world stage; one way of achieving this is to strengthen agreements with local bodies both inside and outside national borders. I am therefore convinced that we need to look beyond the traditional concept of "boundaries", which is not set in stone as the history of nations has shown. We need to create multiple institutional synergies from which Veneto's citizens can reap the rewards. The regional government plan includes a set of economic and structural priorities that are based on analysis drawn from the most highly accredited official sources; this analysis features in the Statistical Report 2010 and focuses on simplification, which mainly involves streamlining bureaucracy, in line with the agenda of the national government. The plan also seeks to make Veneto and all of its production sectors more competitive at international level. We must also rethink the quality of local products in order to ensure that they are one hundred percent Made in Veneto. Consequently, attention is being focused on agriculture, one of Veneto's key sectors and a guarantee of excellence; if Veneto is to lead the market, then it is on this excellence that the region must concentrate. Another top priority is work, and we are committed to introducing policies that support a region with a deep-rooted work ethic, one whose people produce great wealth and account for nine percent of the nation's workforce. Consequently, as we find ourselves in the midst of a major crisis, today more than ever, federalism is a right both for Veneto and for the entire nation. As the President of Italy Giorgio Napolitano said "Territorial autonomy is a need and is no opposition to national unity". As the Lisbon Agenda draws to a close, Europe still has major priorities: alongside fostering knowledge-based growth and involving citizens in a participatory society, the European Union also needs to gear its efforts towards building a more competitive, interconnected and greener economy. Over the next few years, the hallmark of our work will be a move towards federalism; consequently it will become clearer than ever before that Veneto's young people, women and families have the innate potential, strength and ability to create the positive relations needed to achieve this goal. In recent decades, there have been many-perhaps too many-laws that have reformed, modernised and reviewed the workings of Italy's Public Administration. However, even though figures show that Veneto has streamlined procedures to achieve greater efficiency, as have other regions in the North of Italy, we are convinced that we can do more, and do better, so that not only will we continue in this direction, but also strengthen and encourage it. Today, the Public Administration needs to measure up to multi-level governance, a move actively encouraged by the European Union and therefore deeply rooted within the institutions of a range of Member States. Thus Public Administration needs to be more accountable for its actions: towards the other levels of government providing the funds, but especially towards the people who use its services. The Statistical Report 2010, which I am pleased to present for the first time, is an important stage within this process. This year's theme, A Development Network, enables us to understand the phenomena emerging in Veneto and thus to govern accordingly. I hope that this report will provide an even further insight into Veneto and that it continues to be a useful tool for governance and for dialogue with all social partners. This year sees the seventh edition of The Statistical Report. The challenge we threw down in 2002 with the first Regional Economic and Financial Planning Document (DPEF) was to align the production and use of official statistics with the regional planning cycle, in accordance with Regional Law LR no. 35/2001. As years have passed, we have gone about our business using the tools made available by statistical methodologies, which have always enabled us to make conscious decisions based on shared information and objective interpretations of life in Veneto. Veneto's Regional Economic and Financial Planning Document, its Regional Development Plan, which sets out the path for the Third Veneto in the coming years, and its Regional Coordination Plan, which traces Veneto's development through its objectives system, are based on what Veneto is today and what it will become, by making a quantitative and qualitative comparison with the most developed regions in Italy and Europe. 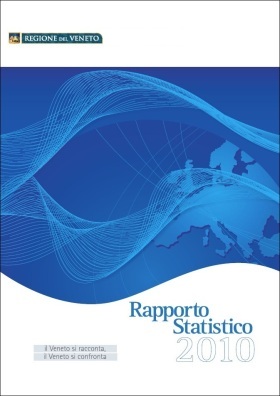 Our main planning documents are always accompanied by interpretations of life in Veneto, which are produced by the Regional Statistics Directorate; today Veneto: sharing facts - comparing facts is an information landmark for everyone who lives here. The report is available in hypertext format on the Regional Government website at www.regione.veneto.it/statistica both in Italian and in English. Data processed by the Statistics Office of Regione Veneto are collective property; reproduction of this material is authorised for non-commercial purposes only, provided the source "Regione Veneto - Regional Statistics System Management" is acknowledged. English translation by the University of Padova Language Centre.